In the beginning of 2015, USA Today launched a wave of publications on a handheld radar called RANGE-R that has been used by the U.S. police and other government services. The radar system is able to ‘see through the walls’. To be more accurate, it registers motion inside closed spaces. The radar system’s high sensitivity is able to detect a hiding man’s breathing somewhere deep inside a building, behind several walls. The existence of such a device was surprising for many journalists tasked with publishing the features of RANGE-R. However, these radars have long been in mass production for military and intelligence-service needs. RANGE-R systems have been used in FBI hostage-rescue missions, by firefighters during collapsed building search-and-rescue operations, in the U.S. Marshals Service operations when catching fugitives, and so on. Prior to that, the technology was only available for some governmental services. Today, the radar system is more widely used due to technological advancements that contributed to price decreases. 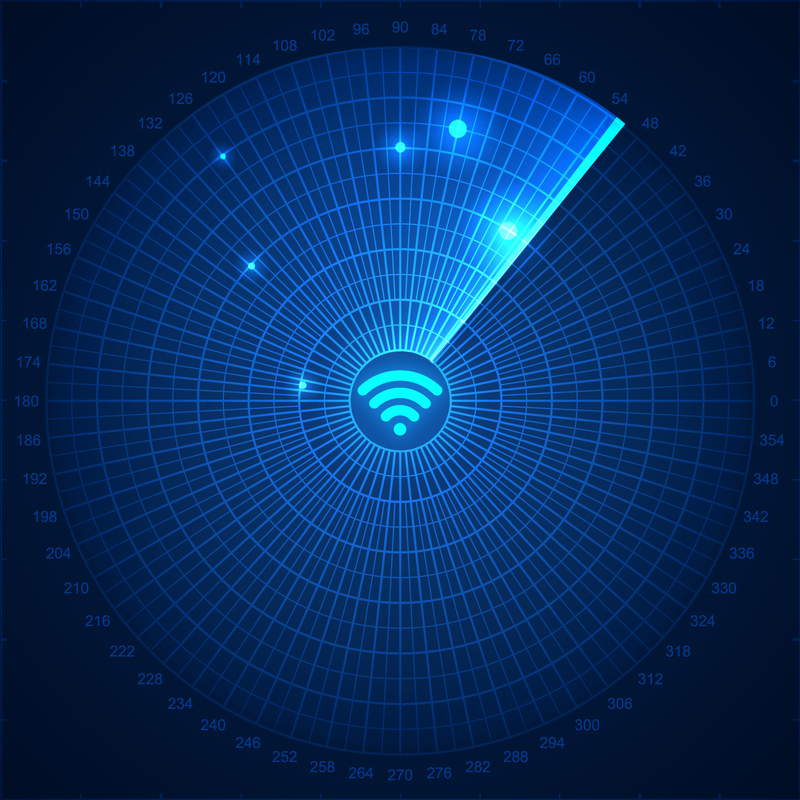 The RANGE-R radar system costs approximately $6,000, while prototypes for new radar systems are being built from accessible low-cost Wi-Fi modules. Therefore, as technology continues to advance and prices continue to drop, it would not be surprising if criminals start taking advantage of this equipment in the future— making now the right time to scrutinize the technology and its features. The sensor technology of RANGE-R is called Through-the-Wall Sensors (TTWS). Just like with other radars, the sensors ‘light up’ the field of view with radio waves that upon striking a target, return to a receiver that registers the reflected radiation. This is only easy to do it in theory. In practice, the creators of TTWS had to combine several technologies and advanced data processing methods in one device. Radar operators have to undergo lengthy training in order to learn how to interpret the radar data. Most TTWS radars operate in the frequency range of 1-10 GHz. The radiation in this range is good at penetrating concrete, wood, plastic, glass, and other walls. To demonstrate the validity of this statement, scan your home or office, which usually is congested with Wi-Fi networks. The higher the frequency, the less the radiation penetrates through walls. At the same time, higher frequencies increase the accuracy of object size and distance measurements. Furthermore, some materials absorb radio waves selectively in a narrow range. That is why advanced scanners can switch frequencies on the go or utilize a wide range of the radio spectrum. Working with short impulses allows users to evaluate the distance to an object by measuring the time it takes for a wave to travel back and forth. Motion detection is based on the Doppler shift: a wave reflected from a moving object slightly changes its frequency, allowing, for example, the detection of the near-static motion of the chest of a breathing man. There is no doubt that TTWS devices have a lot of limitations. The main restriction is that the radio waves cannot penetrate metal. Thus, detecting a man in the closed body of a car or in a building encased in aluminum siding is impossible. Water has properties similar to metal: a wet porous concrete is quite an effective defense against TTWS radio waves as well. Generally, a thick layer of concrete or brick weakens signals. It is usually impossible to detect anything if the total thickness of walls that separate the radar and the object is over 12 inches (about 30 centimeters). The detection range of most devices is 50-65 feet (about 15-20 meters), while devices with bigger antennae and stronger power supplies can ‘knock through’ approximately 230 feet (about 70 meters). There are a lot of moving objects inside of a house, such as a dog or a curtain caught in a draft. While radars are generally used to detect humans, the interpretation of an object is not always definite, especially when the measurement process is very fast. A standard measurement takes approximately a minute. Most radars are handheld. A radar operator has to press the radar against the wall of the inspected building to eliminate tremor. Sometimes, there are situations when it is impossible to approach the wall. That is why some radar models are equipped with tripods or are mounted on robots or drones. The least complicated TTWS radars simply show whether someone is alive and/or moving within the building. More complex devices detect the distance to the object and its direction, giving an approximate layout of the building and its internal objects in two or three dimensions. Experimental solutions already look promising (at least under laboratory conditions). For instance, a mobile radar Wi-Fi system mounted on robots generated a map of a completely unknown house with a 0.7-inch (or 2-centimeter) accuracy. This technology is still a fiction for mass production. How to counter it. The best defense against TTWS-spying is a shielded building. If your house has reinforced thick concrete construction, then you do not need to do anything. Otherwise, aluminum siding or metallized wallpaper is a good solution. Thinking more outside the box, you can elect to keep three dogs in your house, as mass-production radars cannot detect more than three targets at once. If you follow popular science news, then you have surely heard something about terahertz detectors that can see through walls and sense bombs from afar. Publications of a similar kind appear periodically on the Internet after a brisk press release from some laboratory that announces for the nth time that they’ve made some considerable success towards something. As a matter of fact, terahertz radars are only used for passenger inspections at airports. These radars became famous because of their ability to ‘strip people’, meaning they reveal a very detailed picture of a human body that is hidden under clothes. The majority of other applications of ‘the terahertz’ (which covers the range of 300GHz-10THz) remain science fiction. In reality, there are a lot of unsolved problems ranging from the signal fading while penetrating various barriers to the construction of high-power compact radiation emitters. There is one more urban myth: infrared cameras that look through walls. Contrary to popular belief, thermal detectors cannot do anything of the sort. An infrared detector cannot even see through a layer of frosted glass or plywood. How to counter it. Take off your foil cap or put it on. It’s your call. What kind of voices do you hear? Everyone who has seen a spy film, even just once, knows that any conversation can be eavesdropped on from afar, even through windows. The glass vibrates under the impact of sound waves, and the motions can be read with a laser. As a countermeasure, cheap and effective ‘jammers’ were invented that can be attached to the glass to generate random noise. Contemporary spies lead easier lives. They can recover a conversation by analyzing a silent video with only a part of the room visible on camera. The general principle is the same: any object subjected to vibrations can act as a membrane. This can be a bag of chips, the surface of a glass of water, or the leaves of a ficus plant. The standard window jammers will not prevent cameras from picking up sound. However, to decode the conversation, the video must be shot with a special high-speed camera that can record several thousand frames per second (the value must be higher than the voice frequency). Nevertheless, high-speed cameras are everywhere these days. A lot of contemporary smartphones can take videos with a high frame-per-second frequency from which we can extract valuable data. For example, these videos can help to identify participating individuals in a conversation. Spying through windows is no longer a problem as drones have become cheaper and more advanced. How to counter it. A curtain or blinds will prevent the possibility of ‘video-eavesdropping’. It is important that the curtain should not act as a sound membrane; so, opt for a heavier material, or attach an aforementioned jammer to them.